A relatively young star located about 300 light-years away is greatly improving our understanding of the formation of Earth-like planets. The star, going by the unassuming name of BD +20 307, is shrouded by the dustiest environment ever seen so close to a Sun-like star well after its formation. The warm dust is believed to be from recent collisions of rocky bodies at distances from the star comparable to that of the Earth from the Sun. The results were based on observations done at the Gemini and W.M. Keck Observatories, and published in the July 21 issue of the British science journal Nature. This finding supports the idea that comparable collisions of rocky bodies occurred early in our solar system's formation about 4.5 billion years ago. Additionally, this work could lead to more discoveries of this sort which would indicate that the rocky planets and moons of our inner solar system are not as rare as some astronomers suspect. "We were lucky. This set of observations is like finding the proverbial needle in the haystack," said Inseok Song, the Gemini Observatory astronomer who led the U.S.- based research team. "The dust we detected is exactly what we would expect from collisions of rocky asteroids or even planet- sized objects, and to find this dust so close to a star like our Sun bumps the significance way up. However, I can't help but think that astronomers will now find more average stars where collisions like these have occurred." For years, astronomers have patiently studied hundreds of thousands of stars in the hopes of finding one with an infrared dust signature (the characteristics of the starlight absorbed, heated up and reemitted by the dust) as strong as this one at Earth-to-Sun distances from the star. "The amount of warm dust near BD+20 307 is so unprecedented I wouldn't be surprised if it was the result of a massive collision between planet-size objects, for example, a collision like the one which many scientists believe formed Earth's moon," said Benjamin Zuckerman, UCLA professor of physics and astronomy, member of NASA's Astrobiology Institute, and a co-author on the paper. The research team also included Eric Becklin of UCLA and Alycia Weinberger formerly at UCLA and now at the Carnegie Institution. BD +20 307 is slightly more massive than our Sun and lies in the constellation Aries. The large dust disk that surrounds the star has been known since astronomers detected an excess of infrared radiation with the Infrared Astronomical Satellite (IRAS) in 1983. The Gemini and Keck observations provide a strong correlation between the observed emissions and dust particles of the size and temperatures expected by the collision of two or more rocky bodies close to a star. Because the star is estimated to be about 300 million years old, any large planets that might orbit BD +20 307 must have already formed. However, the dynamics of rocky remnants from the planetary formation process might be dictated by the planets in the system, as Jupiter did in our early solar system. 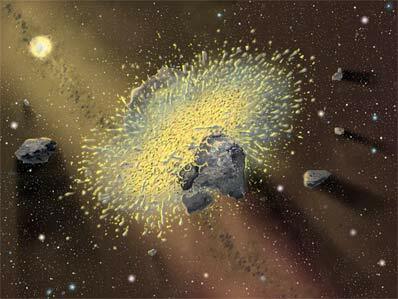 The collisions responsible for the observed dust must have been between bodies at least as large as the largest asteroids present today in our solar system (about 300 kilometers across). "Whatever massive collision occurred, it managed to totally pulverize a lot of rock," said team member Alycia Weinberger. Given the properties of this dust, the team estimates that the collisions could not have occurred more than about 1,000 years ago. A longer history would give the fine dust (about the size of cigarette smoke particles) enough time to be dragged into the central star. The dusty environment around BD +20 307 is thought to be quite similar, but much more tenuous than what remains from the formation of our solar system. "What is so amazing is that the amount of dust around this star is approximately one million time greater than the dust around the Sun," said UCLA team member Eric Becklin. In our solar system the remaining dust scatters sunlight to create an extremely faint glow called the zodiacal light (image available on web). It can be seen under ideal conditions with the naked eye for a few hours after evening or before morning twilight. The team's observations were obtained using Michelle, a mid-infrared spectrograph/imager built by the UK Astronomy Technology Centre, on the Frederick C. Gillett Gemini North Telescope, and the Long Wavelength Spectrograph (LWS) at the W.M. Keck Observatory on Keck I both on Mauna Kea Hawai'i.